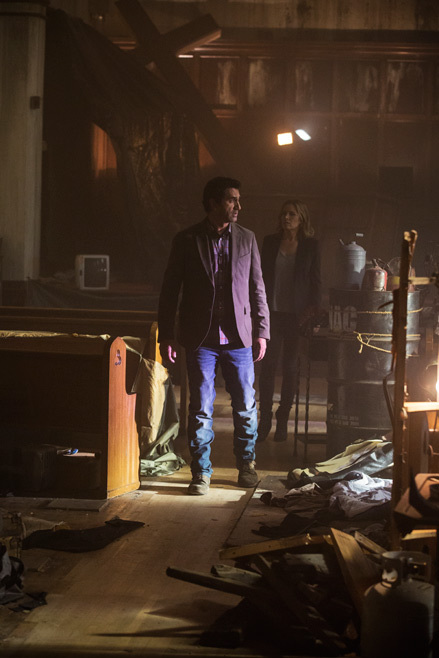 Fear the Walking Dead follows an extended family as they become increasingly aware of the infection. 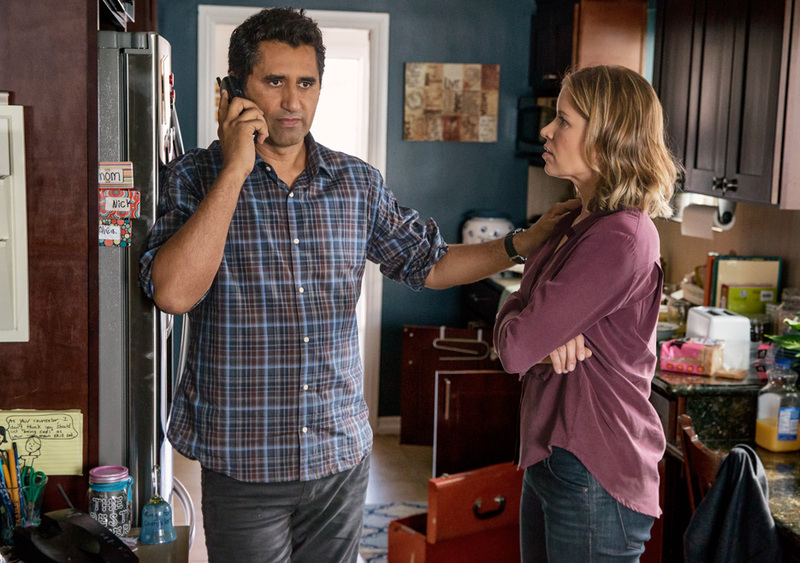 School guidance counselor Madison Clark (Kim Dickens) and her fiancé, teacher Travis Manawa (Cliff Curtis), are a couple struggling with their blended family. Madison’s high achieving daughter Alicia (Alycia Debnam-Carey) yearns to escape her family, while her troubled son Nick (Frank Dillane) struggles with heroin addiction. Travis’s ex-wife and nurse-in-training Liza Ortiz (Elizabeth Rodriguez) tries to keep their son Chris (Lorenzo James Henrie) involved with his father, but Chris is resentful of his father and his new family. The emergency service workers, such as the police and hospital staff, are the front line in this outbreak. It’s difficult to determine if these hospital workers are always harried and curt or if the outbreak is already starting to wear on them. We see and hear a lot of sirens, but it’s hard to distinguish between the usual volume of emergency services in a large urban setting and crisis-level intervention. Though backed-up traffic and helicopters flying overhead may not concern most city dwellers, they take on a menacing tone for the TV viewer who knows what’s to come. Some of the scenes are filled with the despair associated with addiction. Madison worries about Nick as she sees homeless figures in the park. Their silhouettes are reminiscent of walkers, creating a parallel for the all-consuming nature of the disease, a significant difference being that those who suffer from addiction retain their humanity, and they can recover. In an abandoned church, a young man, Nick, wakes up. The church is a shooting gallery where heroin addicts gather. After hearing a strange noise, Nick calls out for his girlfriend Gloria. When there is no response he heads downstairs, where he finds a trail of bloody bodies. He eventually finds his girlfriend, but he’s surprised to find her eating one of the bodies. She tries to attack him and he runs for his life. He makes it out to the street, where he’s hit by a car. It may be early days of the virus, but clearly the outbreak has reached East LA. Travis is showing his fiancée Madison his manly skills by fixing a leaky pipe. They seem happy until the phone rings. Travis, Madison, and her daughter Alicia all stare at the ringing phone, because in this family early-morning phone calls are never good news. It turns out their fears are justified when they learn that Madison’s son Nick is in the hospital. The police interrogate Nick at the hospital, telling him that he was raving about blood and viscera when he was brought in. He sasses the police, and then his mother throws the officers out when she arrives. Madison immediately begins talking about getting Nick into a treatment facility, but Nick has been down this route many times and isn’t interested. The family begins to argue, and Travis asks everyone to take a breath. Figuring out what to do about Nick is not new for this family. Alicia has already taken the pose of sidelined sibling as she resentfully focuses on her phone. Travis’s ex-wife Liz calls to arrange the weekend visit for their son Chris. Chris isn’t interested in a weekend filled with hospital visits with his father’s new family. Travis relents, and tells Liz that Chris can stay with her for the weekend. Madison and Alicia return to school while Travis stays back at the hospital with Nick. As they drive to school, Madison tells her daughter that Nick will be okay, but Alicia says he’s getting worse. Madison puts up a front for her daughter, as both seem a bit hopeless in regards to Nick getting better. Back at school, Madison rescues student Tobias from being caught with a switchblade. Wow. Talk about enabling. In her office, she asks him why he’d risk his college future. Tobias responds, “Yeah. No one’s going to college. No one’s doing anything they think they are.” He tells her that there are reports in five states and no one knows what it is, adding, “People are killing.” She dismissively gives him the classic adult response of saying he spends too much time on the internet. Then she tries to assuage his fears by saying, “If there’s a problem we would know about it. The authorities would tell us.” Hmmmm … would they? Tobias goes back to class, his fears ignored, as often happens with those who try to provide early warnings. Alicia finds her boyfriend Matt painting out by the field. She wants to skip, but he can’t afford to miss class. The concerned Travis later goes to the church to check it out. For some crazy reason he waits until it is dark. Whether you’re worried about zombies or people shooting up, daylight is your friend. Travis runs into a squatter, who screams, “Don’t kill me,” and runs away. Seems like a sign it’s time to leave. Of course Travis goes in anyhow, and manages to fall into a puddle of blood. Uh, he really should have known better. Madison visits her sleeping son. Hospitals are no fun, but this hospital is particularly depressing. The camera sweeps over to the man sharing Nick’s hospital room, making us all wonder how soon he will be turning. The hospital gloom must be affecting Madison because she starts to cry. Travis Manaway (Cliff Curtis) hugs Madison Clark (Kim Dickens) at the hospital while Alicia Clark (Alycia Debnam-Carey) sits in the background. As they go out to the car, Travis tells Madison about the drug den, but she doesn’t seem willing to believe that Nick might be telling the truth. Madison tells Travis that he’s enabling Nick and that he can’t substitute helping Nick for resolving his problems with Chris. She’s in her annoying school counselor mode. Travis tells Nick that the psychiatrist is coming to see him today. Nick says he will talk to the doctor and try to get clean. At the hospital, Nick is concerned about his roommate’s ragged breathing. So are we. He asks the nurse to untie one of his restraints while he uses the bedpan. As soon as she leaves, Nick starts to untie the rest of his restraints. Just then his roommate starts to code and a medical team arrives. They attempt to revive the man, and the Doctor comments, “If we don’t get a rhythm in 60, I want him downstairs.” After the man’s heart fails to restart the doctor shouts, “Okay, this gentleman needs to be downstairs now!” We can’t help but wonder, what’s downstairs? 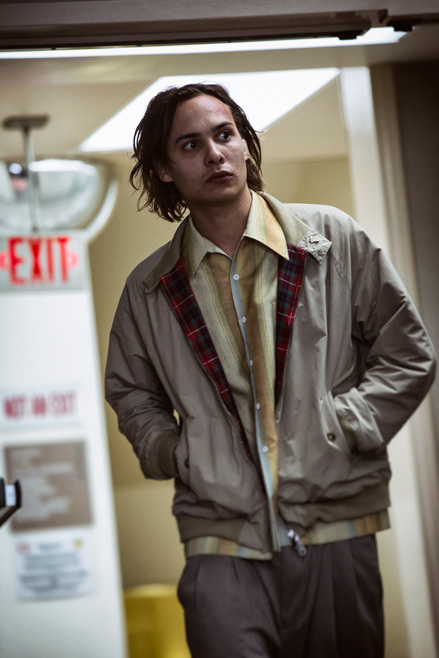 When everyone leaves it gives Nick a chance to escape the super depressing hospital wearing his roommate’s old man clothes. As he passes one of the other rooms, he sees a woman stroking the hair of a man who we’re not sure is still human, but Nick shrugs it off and continues to make his way out. Madison and Travis show up at the hospital and demand the nurse find Nick. The harried nurse tells them they need to call the police and rushes off. She’s only a nurse, not a miracle worker. Madison has Travis take her to the abandoned church, which only makes her feel awful. All we can think is, “Stop touching things.” She sees the blood stains and finally believes that something terrible happened there. They stop by to see Nick’s clean-cut friend Calvin, who says he doesn’t know where Nick is, but says he’ll make some calls. Out in the city, Nick has bought a phone and is desperately trying to get in touch with someone, seemingly his dealer. Felicia is having her own problems making contact as she waits for her boyfriend Matt in Venice Beach. He never comes, so she eventually leaves. As they drive home from the church, Madison says despairingly, “Travis, he’d rather sleep in that place than his own bed. I don’t know that I want him to come home.” They get stuck in traffic due to emergency vehicles in the road. Helicopters circle in the air above the scene. They hear gunshots and Travis manages to drive the truck back onto the highway, leaving the area. At the school office, the teachers are gathered around, watching a video of the previous night’s shooting. It shows victims, who should be dead, attacking their would-be rescuers. Even after being shot multiple times the victims continue to come after the emergency personnel. In class, Alicia’s teacher is going over something about the brain—too bad she’s not listening. Instead she and her friends are watching footage of the shooting on their phones. Alicia says, “It’s not real. It can’t be real.” Though she’s more worried about the fact that her boyfriend Matt hasn’t contacted her. The principal decides to close the school for the day because of the panic over the shooting video. Oh, and there’s also the fact that hardly any kids have come to school. It does seem like it would take more than concern about a shooting to close schools, but perhaps, as student Tobias indicated earlier, other information is emerging. Perhaps Travis and Madison just aren’t big internet users. Nick is freaking out. He meets his dealer, who happens to be that clean-cut Calvin who Madison and Travis came to see the day before. Nick wants to figure out what happened at the church. He wonders if the heroin was laced with PCP, which Calvin takes offense to. Calvin already knows that Nick has talked to the police at the hospital, courtesy of Nick’s mom who has no idea that Nick’s nice friend Calvin is his very dangerous dealer. It’s those charming kids that parents should always be most suspicious of. Calvin takes Nick for a ride out to the aqueduct, ostensibly to get high, but really to kill him. Crap. As he emerges from the car Nick sees the gun and somehow manages to shoot Calvin. Panicked, Nick calls Travis for help. Travis and Madison arrive, but when they look for Calvin, his body is gone. Well, he’s not really gone, he’s lurking in the tunnel, zombified. Of course when they see the charming Calvin lumbering in the tunnel, Travis and Madison jump out to help him. They have not yet become familiar with the gait of the dead. Naturally zombie Calvin attacks them. Nick sees what is happening and has the good sense to back up and run over Calvin. When Calvin rises again, growling and eyes discolored, Nick rams him with the truck once more, throwing his body into the aqueduct. Madison, Travis, and Nick walk out of the tunnel, staring at Calvin’s broken body. Then Calvin begins to move. Let’s hope Madison finally believes her son. Since this summer series will be short, it’s worked well to show our protagonists evidence of the infected early on. Once people start turning, we expect things to devolve quickly. It’s a fun perspective for the audience to know more about the virus and its impact, while the protagonists struggle to understand what’s happening. It’s a fresh approach that will allow for some interesting dynamics. It also provides for a few horror movie moments, like when the principal has his back to Madison and doesn’t respond to her for a minute and we wonder if he’s a zombie. 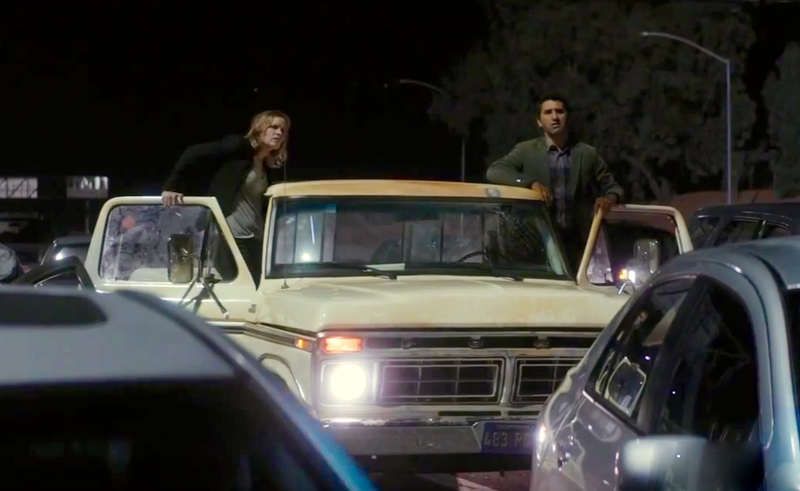 Travis Manaway (Cliff Curtis) and Madison Clark (Kim Dickens) stuck in traffic. Though school counselor Madison is not the best listener, she is resilient. Travis is a strong character and appears to take a lot of responsibility for his family. A family that has already survived difficult times seems like they would be more likely to survive a zombie apocalypse. At least for ten weeks. Though Fear the Walking Dead isn’t going to drive tourists to Los Angeles, we like how Los Angeles landmarks are showcased. Though we can imagine that LA viewers are screaming things like, “They would never go to Venice Beach to watch the sunset—it’s so far,” it’s a great location. The expansive yet urban landscape of Los Angeles will create unique settings and drama. Fear the Walking Dead gives us a very different and interesting perspective of the outbreak through the early timeframe, family focus, and urban location. 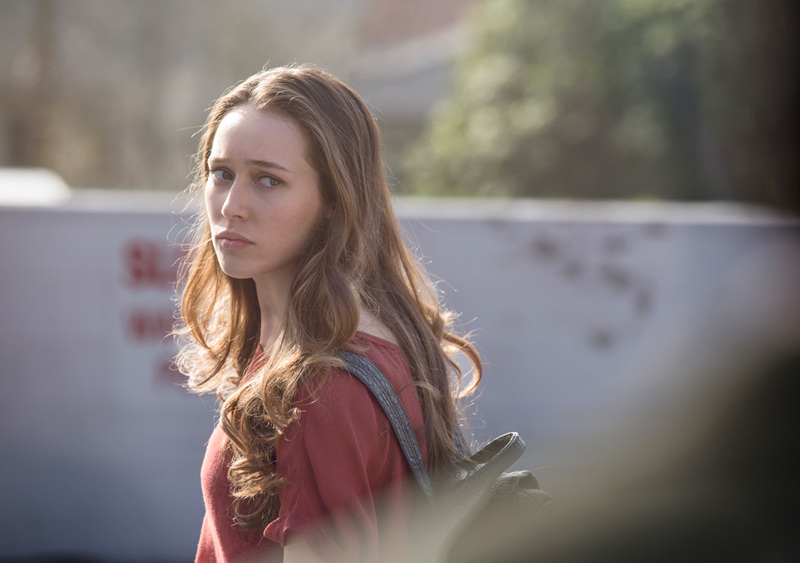 We’re looking forward to a summer of Fear the Walking Dead. I’m of two minds about Fear the Walking Dead. First, can’t watch it live because it airs the same time as Show Me a Man, but otherwise, I may just check it out on the side. I’m not too invested in the idea of initial reactions to the outbreak or a spin-off that talks about the beginning because I feel that Rick’s reaction when he woke up from his coma told us everything that we need to know. I’m interested in the concept, and the slow build is at least something different than The Walking Dead’s own series premiere, but I’ll need some time to really get invested in it. Plus, the fact that this isn’t based off of any pre-existing material gave me pause, but at the very least, I can appreciate the fact that the creators behind this ARE attempting something different. The Walking Dead, both on television and the comic, has explored a lot of territory and while this would purely filler since it’s original material, I’m interested to see where it goes. I just need a good hook.